The Nova Scotia Department of Community Services (DCS) is in the process of revamping its Employment Support and Income Assistance program (ESIA, i.e. welfare). The stated goals are to create a system that truly helps the client, is easier to navigate, and allows the client to reach their full potential. In an effort to achieve these goals, DCS has reached out to clients for help via an online survey, and a series of focus groups called “First Voice” consultations. As someone who is on the system, and a caregiver for a former ESIA recipient, my experience and frustration with the system is two-fold: In the past, I’ve had to advocate for myself, and for my mother, often at the same time. I am so glad that she is officially off the NS welfare system. Let’s discuss the survey, which was found here. (Note: as I am writing this, it appears that the survey is no longer live). I have two issues with the survey. Perhaps the biggest issue resides in the very first question, pictured below. This question represents a possible disconnect between how DCS actually operates, and whoever put the survey together. The fact that “Internet” is listed as an option is a complete and utter joke. If you were to go to your local DCS office and expect to see your caseworker, you would be disappointed. DCS caseworkers do not meet with a client unless they have an appointment. Signage at DCS offices even states that fact. It just doesn’t make any sense for “Visit office (in person)” to even be listed. You have to call your caseworker and make an appointment. Simply calling your caseworker also presents a challenge. (Ironically, unless you have a medical reason, you do not get funding for a phone.) You call your caseworker, and hope that you hear back. Sometimes it takes a complaint to the caseworker supervisor to get the caseworker to call you back. The fact that “Internet” is listed as an option is a complete and utter joke. Nobody gets an internet expense. Period. No such thing. I have asked people, in person and on various Facebook pages, if they have ever communicated with their caseworker via the internet/email. Only one person stated that they had communicated via email with the caseworker. Everyone else (including me) had no idea it was even an option. 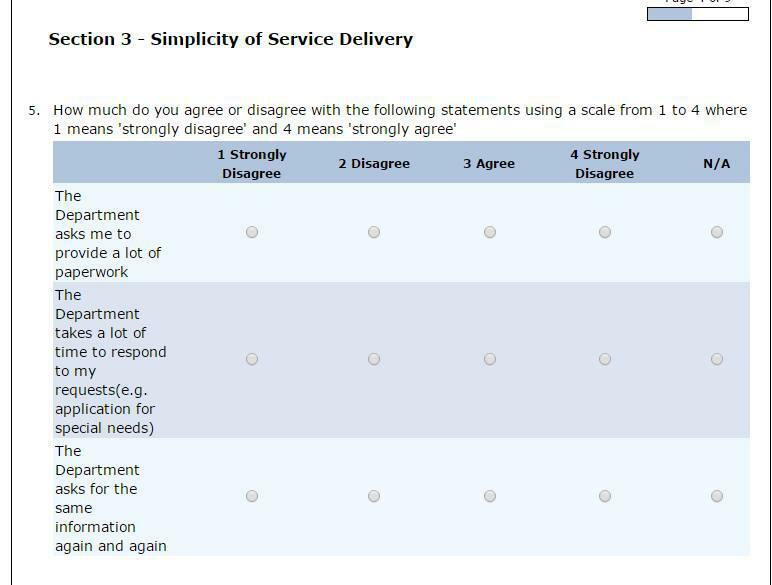 Another issue I had with the survey was in Section 3 (pictured above). Please take note of how “Strongly Disagree” is listed twice (option 1 and option 4), and that choosing “Strongly Disagree” would paint DCS in a positive light. This typo was present for at least 3-4 days before being fixed. I asked a few friends, they didn’t notice the mistake, and chose option 4, thinking it said “Strongly Agree”. I brought a copy of this screen cap to a “First Voice” meeting, and a DCS rep confirmed that choosing option 4 registered as “Strongly Agree”, despite the typo. There were a dozen clients at the meeting that I attended (four men, eight women). As we soon found out, we were one voice, all of us voicing the same concerns and issues. I brought a list of my concerns/issues, as did a few of my fellow group members. DCS was represented by two people; a man named Brandon, and a woman named Kathleen. Kathleen took notes on the proceedings and our issues/suggestions. We were given the option of having a copy of the notes either mailed or emailed to us. I chose email. These are cumulative, from all the focus groups. He was described as someone who doesn’t return calls, and is rude and unfair to clients. As I am writing this, I haven’t received any notes, but I should be receiving a copy shortly after the focus groups have completed. The facilitator of the meeting was a man named Tim (coincidentally, my first name). Tim assured us that he had no affiliation with DCS. Below is a print out that we were given, that served as a guide for our discussion. As an aside, I decided that I wanted to take a broad/general approach to my issues with the system, and not focus on particular people who work for DCS. My fellow attendees, however, had no problems using names of specific DCS employees that they had problems with. In fact, one man’s name (a caseworker) was brought up repeatedly throughout our 3 hour conversation. He was described as someone who doesn’t return calls, and is rude and unfair to clients. Coincidentally, I have had several issues with this particular man over the years, and was treated in the way described by my fellow group attendees. While I chose not to use names, I certainly haven’t lost any sleep due to other people using names. In order to qualify for a bus pass, a person has to have 12 or more medical appointments a month. If you have fewer appointments, you get $20 a month for bus tickets. No medical appointments = No transportation expense. There is no funding at all for non-medical appointments. Phone and transportation are not “special needs”; they are basic needs that are a necessity to be a part of the community, and to achieve and maintain physical and mental health. Caseworkers not returning calls, or being rude/ disrespectful to clients, and not following DCS policies. A recipient is entitled to a bed, up to a maximum value of $200. This money is to be paid by DCS via a purchase order (the recipient doesn’t have access to that money at all), and is not to be deducted from the recipient’s cheque/deposit. People complained that caseworkers were counting these purchases as an advanced payment, and then deducting the money from the following month’s cheque/deposit. Women reported that caseworkers have told them to have a baby if they wanted help from DCS. Not only is this a rude, demeaning statement to make, but if you ask any recipient who has a child, they struggle just as badly as, if not worse than, anyone else on the system. Rates (i.e. monthly payments) being inadequate. The maximum shelter allowance is $535 per individual, $570 for a family of 2, $620 for a family of 3 more. These are not realistic amounts for anyone living in HRM. In order to make rent, a recipient must reallocate their funds. This results in fewer groceries and/or bills not being paid. One woman said that she has just $27 a week for groceries and personal care items, which is perfectly in line with the example shown in the documentary “My Week on Welfare”. try to put yourself in the shoes of someone with a mental or emotional disorder, and then try to comprehend and deal with being penalized over paperwork that you know was done. There are a wide variety of people on the system, many of them with mental or emotional disorders. For a moment, try to put yourself in the shoes of someone with a mental or emotional disorder, and then try to comprehend and deal with being penalized over paperwork that you know was done. It is advisable that clients keep a copy of any and all paperwork (especially Doctors notes) in case issues like this arise. If not, the client invariably has no choice but to go back to their doctor, and get the paperwork done again. I wonder how much these additional visits to the doctor cost the province. Overworked caseworkers. Some numbers put a caseworker’s case load at 250+ clients. Even if you have a caseworker who genuinely wants to help you, there are bound to be issues simply due to his/her caseload. We need more real Social Workers. While many people employed at DCS have a Social Sciences education, many others do not. Unfortunately, this also includes management at DCS, as well as caseworkers. That means that you have people with Social Sciences degrees taking orders from (and working alongside) people who do not. A social sciences education should be mandatory for anyone working at DCS. Clients going an extended period of time without a caseworker. For those who don’t know, if you require the assistance of a caseworker, and you do not have one, you call the front office of your local DCS office, and leave a message with the receptionist. The first available caseworker (again, someone with possibly 250+ clients of their own) will hopefully call you back that day. That caseworker will access your file, and help you if they can. My mother was booted off the system, during a time in which she didn’t have a caseworker. Why? The reason we were given is that because she didn’t have a caseworker, no one noticed that her benefits were expiring. If you have a problem the next week or next month, you have to repeat that process, and this time it will likely be yet another caseworker accessing your file. Disastrous things can happen when someone is without a caseworker for an extended period of time. My mother was booted off the system, during a time in which she didn’t have a caseworker. Why? The reason we were given is that because she didn’t have a caseworker, no one noticed that her benefits were expiring. After I made a few phone calls, she was re-added to the system. Logically, that means for every unassigned caseload, there are 250+ clients (individuals and families) at risk of suddenly losing their benefits, simply because no one at DCS notice the benefits expiring. Transparency. People in the group lamented that DCS caseworkers requiring so much paperwork from clients; however, when a client is cut back (or worse) the caseworker is not required at all to send documentation notifying the client of the cutback. In fact, even if a client requests, in writing, a reason for the cutback, no such paperwork is provided. The annual review. It’s the bane of a recipient’s existence. An annual review is a meeting with your caseworker, where you provide a bank statement (sometimes 3), phone bill, light bill, proof of assets, etc etc. In the past, the client had the choice of having this meeting at a DCS office, or in the client’s home. In a cost saving measure, home visits have been eliminated. In-office is now the only option for these meetings. The problem with this is that many recipients have mobility issues, and/or simply do not live close to their local DCS office. As mentioned earlier, DCS does not fund ANY non-medical travel expenses, including travel to DCS offices. Blue/Green medical evaluation forms. These are usually given to the client during the annual review. These forms are done annually, and must be filled out by your doctor. These forms are used mainly to determine employability…even for those who are permanently disabled and unlikely to get better (in their own Doctors words). There a multitude of problems with these forms. Many Nova Scotians are without a doctor, and find it hard to find one. Many Nova Scotians (like me) have illnesses that are rare or hard to define, which makes it difficult for a Dr to fill out the form. Some doctors even refuse to fill out the form (in part or entirety), which in turn can and often does lead to reduction in benefits. Kathleen told the group that the new DCS will be in effect in 2018. Without being specific, she said that she expected that some changes would take place in this calendar year. We were compensated in the form a $100 gift, which we did not have to report to our workers. Last year, DCS paid two consultants a total of 1.5 million dollars to advise on how to fix the system. This year, DCS has turned to the clients. I can’t help but feel that those consultants were a costly middle step that could have been skipped. 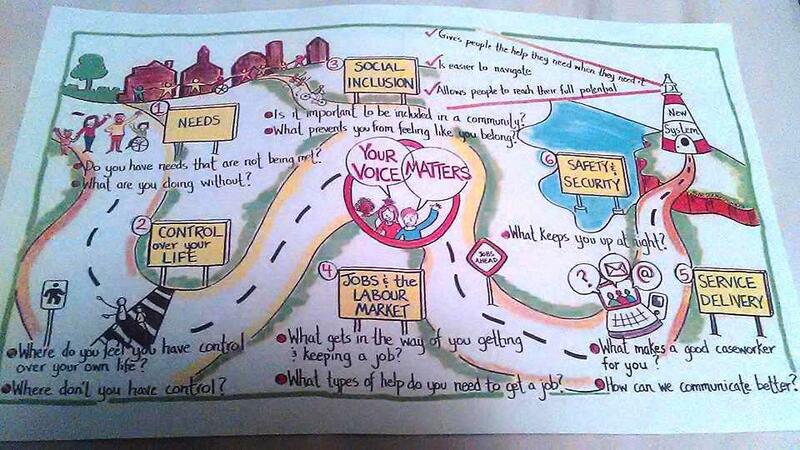 This article is a representation of my concerns and points that I wanted to voice during the First Voices consultation. As it turns out, many of these points were made by other attendees. It was called “First Voice”, but it was more like “One Voice”. When asked by Tim, we all said that it was nice to be heard. We agreed that if DCS wanted to do more of these consultations, we would all attend. Our “One Voice” was heard…I hope.